This bag works & looks great! Not cheaply made & fits well on planes. Do not hesitate to buy and use extensively. I purchased this bag in July 2018 & used it for a blade euro/morocco trip I made in August 2018. Bag has so many good pockets for anything you'll need to pack SAFELY. Weight distribution is great and you can snug it up to your body and hike around for miles with all of your possessions with you. Your blades are a definite shield of armor while travelling and this bag fits them, holds them tight & lets everyone know you're a good guy/gal! 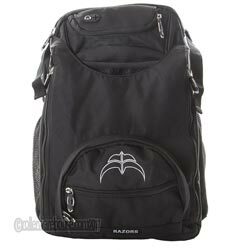 I have loved this bag, i used to have one of those cheap mountain division bags, but they were just not working, this bag allows me to carry my blades and blade essentials, but also be able to carry what ever else I need. Definitely recommend this bag! I was using one of those Mountain Division bags before I got this. This is a definite upgrade from that, the material is much higher quality. Razor has done a great job on designing this so that your skates come in and out with ease. They even hold my skinny carbons in the pouches after months and months of use. Great storage, and the straps that go around your shoulder a heavily padded making it easy to carry work/school crap, along with skating gear. This is exactly what I was looking for in a bag.